Distribute four phone/modem/fax lines to six rooms. 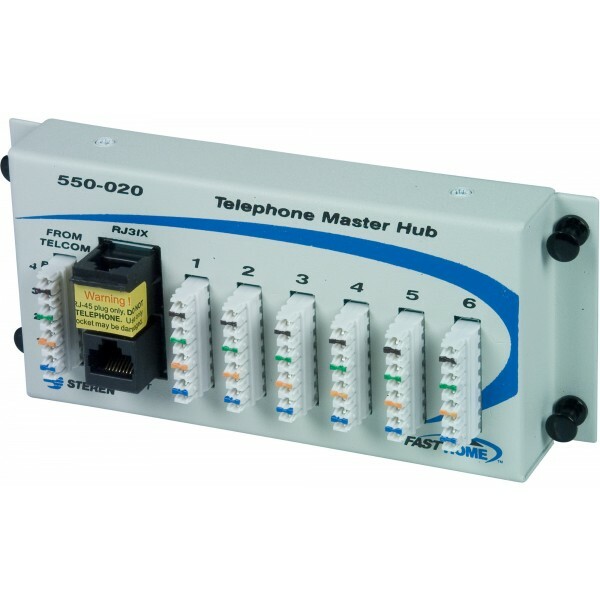 The Telephone Hub Module distributes up to four incoming phone, fax, or modem lines to six locations. The hub includes an RJ31X port for use with your security or life safety/medical alert system,an RJ45 port to connect to the phone network using CAT5e cable, and IDC connectors for terminating the 4 pair CAT5e cable. Expands the phone network via a CAT5e hub. Standard 6" x 2" mounting hole spacing. RJ31X port with gold-plated beryllium copper contacts. RJ45 port with gold-plated beryllium copper contacts. Color-coded CAT5e 110 IDC connectors.